When good people come together for equally good causes, great things can happen. Which is why I’m excited to announce our new, dedicated board of trustees for the Cheshire Health Foundation. Each of these individuals has shown a commitment to making a difference for our community. In their role as Foundation board members, they will enhance community engagement and encourage increased charitable support for Cheshire Medical Center’s health and wellness mission. Their knowledge and experience will guide important decisions at a time when the need for philanthropic support in health care is at an all-time high. Please join me in welcoming our founding Cheshire Health Foundation Board of Trustees: Dr. Bill Chase; Dr. Claire Fabian; Mark Gavin; Cecile Goff; Dr. Roger Hansen; John Hoffman, Jr.; Bob Rooney, Sr.; Katherine Snow; Jane Stabler; Julie Tewksbury; Rob Therrien; Dr. Don Caruso (ex-officio); and Jim Putnam, who has graciously agreed to serve as Chair. The Cheshire Health Foundation has existed for several decades to direct charitable gifts in support of local patient care at our Medical Center, and in recent years, fundraising efforts have grown. Community donations have provided funding for financial assistance to patients in need, nursing scholarships, Emergency Department renovations, the expansion of Healthy Monadnock, sports medicine services for local athletes, and other initiatives that make a positive impact on our patients and community. It is fitting that the new Cheshire Health Foundation Board begins its work this year, as 2017 will mark the hospital’s 125th year of existence in Keene, NH—an existence that was first made possible by the gift of the Elliot home on lower Main Street. John Elliot’s extraordinary vision was quickly joined by many donations from the community to outfit and supply the building to transform it into a working hospital. Those gifts were the beginning of the longstanding tradition of giving to support the hospital. On behalf of both boards of trustees, I extend my sincere gratitude for the generosity of past, current, and future donors who understand the importance of having a medical facility of this caliber so close to home. Please join me in thanking the Foundation Trustees as they begin their work as ambassadors for the Foundation and Medical Center, and stay tuned for more information as we begin to reflect on and celebrate 125 years of caring for our community. 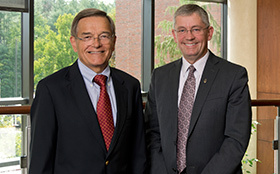 (L to R) Jim Putnam, Cheshire Health Foundation Board Chair with Gregg Tewksbury, Chair, Cheshire Medical Center Board of Trustees.